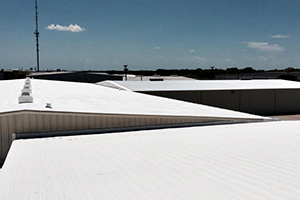 Are you familiar with the benefits of an elastomeric roof coating? If you are concerned about cutting down your utility costs as well as extending the life of your roof, you need to consider a roof coating system. Not looking forward to a costly replacement of a damaged or failing roof? Is your existing TPO roof or other roofing system reaching the end of its life? 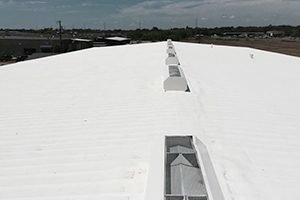 Are you worried your insurance might not cover the entire cost if your commercial roof is damaged in the next Texas summer storm? Not looking forward to the loss of time and revenue that comes with closing your business, just to have that aging and leaky roof replaced? It’s a good thing there are better options as compared to a costly and time-consuming replacement. Applying a durable elastomeric roof coating (also called silicone) to your existing roof allows you to repair damage from thunderstorms, hail, wind, failing and leaky seams, rusting, brittleness, or pooling water without the huge cost of replacement. This type of coating forms a uniform and seamless roofing system, eliminating the cause of the leaks at the source. It simultaneously fills in the leaks you already have and strengthens and reinforces those dozens, hundreds, or even thousands of trouble-prone areas found on every roof — the seams. It stays flexible under extreme temperatures, hot or cold, expanding and contracting with your building. This means long-term durability, lowering the risk of future repairs and promoting a lower total-life cost. A quality elastomeric roof coating can increase the life of your existing roof by up to 20 years. If you have an older roofing system, such as metal, rubber, or bitumen, you should consider that the soaring summer temperatures and all that direct sunlight over the course of a day creates intense heat. What would happen to your energy bill if your roof could reflect a lot of that intense Texas sunlight? A 90-degree summer afternoon would produce temperatures of 180 to 200 degrees on a gray or black roof. But, that same 90-degree summer afternoon would only measure about 130 degrees on a light colored roof. That means an elastomeric roof, with its distinct white color and reflective properties, can give you maximum UV reflection to keep the extreme temperatures on your roof down and reduce your utility bill in the process. That means significant savings — you could save as much as 20% on summer cooling costs compared to a black roof. We highly recommend GE’s Enduris™ Silicone Roof Coating System as a great option for lowering your utility costs and affordably increasing the life of your roof. Did we mention it comes with an added warranty of up to 20 years to back these claims up? We thought you’d be interested. But, when we talk about elastomeric roof coating, don’t forget about SPF (spray polyurethane foam). Let’s look at one case where we asked an actual customer to share their utility bills and find out how much they really saved with our Accella/Bay Seal 3.0 Spray Polyurethane Foam Roofing System with a bright white elastomeric top coating from Everest. The customer owned a 24,000-square-foot, air conditioned, single-story building with a leaking Mod-Bit roof. We installed an SPF roof with an average thickness of 1.5” and an Energy Star rated coating to the entire roof. The customer totalled up the electric bills for both the year before the install and the year after. They were shocked to see that they had paid $39,800 the year before — after installing the SPF roofing system, they paid only $28,000. As you can see, there’s a tremendous amount of money that can be saved by installing an SPF roof. 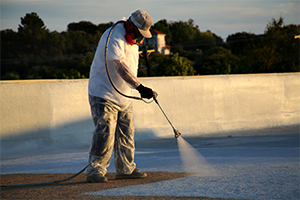 At DFW Urethane, we’re here to help you with all of your commercial roofing and insulation needs in Dallas-Fort Worth. Contact us here to get a recommendation and a quote on an elastomeric roof coating that could save you and your business a lot of money. I’m glad that you out the amount that the customer saved by using a foam roof. Using the foam still seems like a great option for business because of the cost difference. It’s also durable, so it seems to be worth it to have it put on your roof.